There’s something to be said for purchasing a car seat that can take your baby from the newborn stage all the way through toddlerhood. And if this is your goal, you aren’t wrong for going that route. But high back booster car seats are also plenty convenient, especially once your child has reached that stage where a car seat seems silly. Take the Graco Affix Youth Booster Seat with Latch System, for example. It’s designed for kids from 30-100 pounds and up to 57 inches tall, so it’s the only “big kid” car seat you’ll need. But unlike some other similar booster car seats, you can also use your car’s Latch system with it to secure it to your backseat. The little armrests on either side of the seat add comfort to your child as they sit in it and they even make buckling easily for your little one as they grow more independent. The headrest is adjustable to accommodate your growing child and eventually, you can use it as a booster seat on its own rather than a high back booster. There’s even a little pull-out storage compartment and a built-in cup holder for your little one’s snacks. It might not be an installed car seat that you can use for your infant as well, but it does offer comfortable and convenient seating for your toddler and beyond. In that regard, it could be the only big kid car seat you’ll need. You can find it on the manufacturer’s website and Amazon or in-store at Walmart. On Amazon, the Graco Affix Youth Booster Seat is $53. 1.3 Has This Item Been Recalled? 2.3 Has This Item Been Recalled? 3.3 Has This Item Been Recalled? 4.3 Has This Item Been Recalled? 5.3 Has This Item Been Recalled? The car seat is designed for kids from 30-100 pounds and remains forward-facing at all times. It can be used as a high back booster or a standard booster car seat. Instead of simply belting your child in it, the high back booster can also connect to your car with the Latch system. The adjustable headrest has multiple layers of protection and comfort. It’s been tested to meet or exceed all federal safety standards. You can tighten the Latch with a simple pull from the front of the booster seat. It can potentially be used with young toddlers through the age when they won’t even need a car seat anymore. It’s relatively affordable for most families, especially since it’s under $100. The safety and comfort are obvious in the thick padding and multiple layers throughout the adjustable headrest. Even as a high back booster, it’s easy to take the car seat out of your car and move it to another one if necessary. If your back seat headrests jut out a little bit, it can be difficult to get the Graco Affix properly installed. The armrest padding can be hard to take off to clean. The seat belt loop that you thread the belt through on the booster seat can make the seat belt feel a little uncomfortable for some kids. There are no recent, or current recalls on the Graco Affix Youth Booster Seat. Like the Graco Affix, the Chicco KidFit 2-in-1 Belt-Positioning Booster is a toddler booster car seat. But it has even more head and shoulder protection and comfort. It’s clear right off the bat how cushioned the car seat is, but with the safety also there. The booster seat has DuoZone head and shoulder protection, and it can adjust to 10 different positions from the waist for your growing toddler. The seat is designed for children from 30-110 pounds, and like the Graco, it can also be installed with the Latch system. Plus, your child will get two cup holders on either side that they can use for drinks or snacks. You can purchase the car seat on the manufacturer’s website and Amazon. On Amazon, the Chicco KidFit 2-in-1 Belt-Positioning Booster is $100. Check out the latest price! The booster can be adjusted from the waist to make it taller for your growing child. It can be used for kids up to 110 pounds, instead of up to 100 like the Graco Affix. Even for newer parents, it’s easy to put the booster together and install in your back seat. After your child reaches 40 pounds, if they’re ready, they can use the high back booster as a standard booster car seat. It can be difficult for your child to maneuver the seat belt into its buckle while in the booster seat. The headrest isn’t very supportive of the neck area, which can cause your child’s head to slump forward if they fall asleep. Although it’s lightweight, the booster might feel almost too light and flimsy. There are no recent, or current recalls on the Chicco KidFit. The Britax Highpoint Belt-Positioning Booster Seat differs from a lot of other similar booster seats in a very specific way. Instead of being made with the traditional soft fabric, it’s designed with a comfortable and breathable knit fabric. This makes it easier for children to stay comfortable on long car rides and can keep them from overheating while sleeping. It also has two removable cup holders on either side that can each be taken off and cleaned in the dishwasher if needed. Another thing that sets it apart from some other boosters is that the Britax Highpoint has a buckle that can be clipped to the seat belt between the legs to add extra safety and comfort. 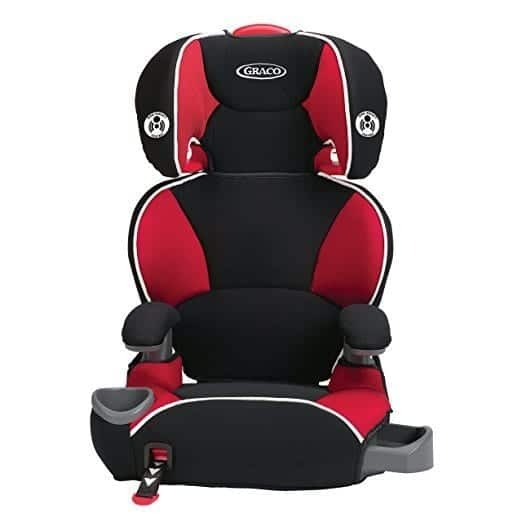 It’s surrounded by three layers of side impact protection and has 10 different positions in the headrest to keep your child supported as he or she grows. It’s designed for children from 40-120 pounds, and you can find it on the manufacturer’s website and Amazon or in-store at Walmart and Target. On Amazon, the Britax Highpoint Belt-Positioning Booster Seat is $150. Check out the latest price! The fabric can keep your baby feeling comfortable and cool instead of feeling overheated after sitting in the booster seat for a while. Since the headrest is adjustable, you can keep your toddler’s neck and shoulders comfortable. The buckle between the legs is unique for a toddler booster car seat and adds a little extra safety. It’s lightweight and easy to move between cars. Compared to other similar booster car seats, it’s a little more costly. The shoulder area is a little narrow, so it might not be comfortable for bigger toddlers or those with broader shoulders. It could probably use a little more padding. There are no recent, or current recalls on the Britax Highpoint Belt-Positioning Booster Seat. Overall, the Evenflo AMP High Back Car Seat Booster is pretty simple to install and fit your toddler in. But whereas it doesn’t have Latch system capabilities or any extra buckle options, it’s still safe and comfortable for little ones from 30-110 pounds. The booster starts as a high back booster and then can be transitioned to a stand-alone booster car seat. As a high back booster, it can be adjusted to multiple heights with just one hand. This makes it easy to accommodate your growing toddler, especially as he or she goes through any growth spurts and eventually grows out of the booster. There are also a cup or snack holders on either side that have elastic bands to stretch to fit whatever snack cups or sippy cups for toddler needs to put in them. And all you have to do to secure your child in the booster is click the seat belt into place across their body. You can find it on the manufacturer’s website and Amazon or in-store at Walmart. On Amazon, the Evenflo AMP High Back Car Seat Booster is $45. Check out the latest price! It’s slim enough to fit at least two, and possibly three, across the back seat in some cars. You can adjust the height of the car seat with ease, as it can be done with a one-handed move. Compared to other similar booster car seats, the Evenflo AMP is plenty affordable. The sides of the headrest add some comfort and padding for children who might fall asleep and lean their head to either side. There isn’t a lot of padding in the actual seat, so it might be uncomfortable for some toddlers. It can’t be installed in cars with the Latch system. There also isn’t a lot of padding in the lower back area of the high back booster seat. There are no recent, or current recalls on this particular car seat. The Safety 1st Summit Booster Car Seat isn’t exactly the same as the Graco Affix Youth Booster Seat in its style, but for the most part, the same idea is there. It can be used as a forward-facing harness seat from 22-40 pounds and a belt-positioning booster from 40-100 pounds, making it another big kid booster car seat to compare to the Graco Affix. The armrests can be moved up out of the way, depending on what your little one wants. Plus, the harness straps are padded for added comfort. It’s equipped to install using the Latch system and there’s even a three-position recline for added comfort and safety. You can find the booster car seat on the manufacturer’s website and Amazon or in-store at Walmart and Target. On Amazon, the Safety 1st Summit Booster Car Seat is $129. Check out the latest price! You can use it from an even earlier weight than some other booster car seats. The recline positions are also convenient, especially for younger toddlers and those who need it in the forward-facing harness position. There’s plenty of cushion throughout the booster seat. It’s easy to adjust the shoulder harness straps as needed. It can be a little bulky in the back seat or when moving it between cars. There isn’t much head or neck support, which can make long car rides uncomfortable for your little one. Although there’s a cup holder on the side, it can be a little difficult for some toddlers to reach. There are no recent, or current recalls on this particular Safety 1st car seat. Overall, the Graco Affix Youth Booster Seat with Latch System is a solid option for a toddler booster car seat. It’s not too complicated, but it does offer easy installation and comfort for children for years. Unlike some other similar booster seats, it isn’t too bulky, and it has safety standards that are unparallel to that of some other similar boosters. There are some other solid options rather than the Graco Affix, but it’s still an affordable and easy to install option for anyone in need of a toddler booster car seat. Graco 4Ever Car Seat: Yay or Nay? Find out here! Holle vs Baby's Only Formula (2019 UPDATE): Which one is Best? Best Jogging Stroller Travel Systems For 2019 and Beyond! Safety 1st Grow And Go Review: Is This the Car Seat for You?